Below we discuss the basic principles of shifts of fluid between the body fluid compartments and then discuss a handful of pathological scenarios in which such shifts commonly occur. The driving force for fluids to shift between the body's fluid compartments is ultimately a difference between the compartments' relative osmolarity. Fluid shifts between compartments until their relative osmolarity is equilibrated and a new steady-state is achieved. Changes in osmolarity typically affect the ECF first because this is the compartment that is most directly in contact with the outside world. Solutes and water can be added to it from the GI tract whereas they can be subtracted from it by a variety of processes, most notably by the action of the kidneys but also by loss from perspiration, breathing, and the feces. Once the ECF osmolarity changes, water shifts into or out of the intracellular compartment, within minutes, until a new osmolar equilibrium is achieved between the ECF and ICF. These graphs provide a representation of the osmolarity (y-axis) vs. the volume (x-axis) of the body's ICF and ECF during states of pathological volume loss. The initial change from normal is given above followed by the compensatory body fluid shift below. As seen, the driving force for the shifting fluid is a change in the ECF's osmolarity. In the case of secretory diarrhea, no change in ECF osmolarity is caused and thus there is no shift in fluid between the ICF and ECF. These figure are not to scale and thus the reader should not try to interpret the quantitative values of the osmolarity and volume, but should focus on their qualitative increase or decrease. With the above basic principles in mind, it is relatively easy to predict how fluid volume will shift in the body during a variety of pathological scenarios. The key step when evaluating these disturbances is to identify what effect the disturbance has on the ECF osmolarity. Any shifts in fluid volume between compartments purely follows from the change in ECF osmolarity. Note, that the below examples are relatively simplified and do not take into account complex homeostatic mechanisms which are brought into play, especially by the kidneys during contexts of fresh water intake. In cases of secretory diarrhea, fluid is secreted from the GI tract with precisely the same osmolarity as that of the ECF; consequently, there is no change in the ECF osmolarity. As a result, there is no shift in body fluid between the ICF and the ECF and thus the total volume of the ECF contracts due to its loss within in the diarrheal fluid. Individuals with Diabetes Insipidus excrete a urine that is more dilute than the ECF, causing relatively more loss of water than solutes from the ECF and thus a rise in ECF osmolarity. Because ECF osmolarity rises compared to that of the ICF, water moves from the ICF to the ECF. Although this movement helps compensate somewhat for the increased ECF osmolarity, it cannot do so completely, and the result is an increase in ECF osmolarity and a loss of ECF volume. Individuals with Chronic Adrenocortical Insufficiency excrete a urine that is more concentrated than the ECF, causing relatively more solute loss than water from the ECF and thus a drop in ECF osmolarity. 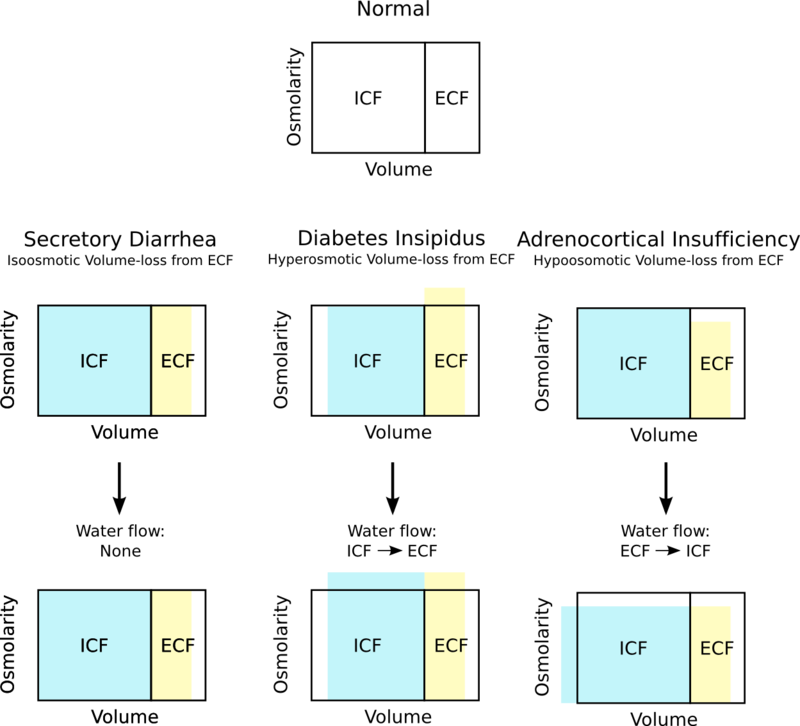 Because ECF osmolarity drops compared to that of the ICF, water moves from the ECF into the ICF, and thus concentrates the ECF. Although this movement helps compensate somewhat for the drop in ECF osmolarity, it cannot do so completely, and the result is a decrease in ECF osmolarity and a loss of ECF volume. Infusion of a saline solution with the same osmolarity as the ECF will not change the ECF osmolarity. 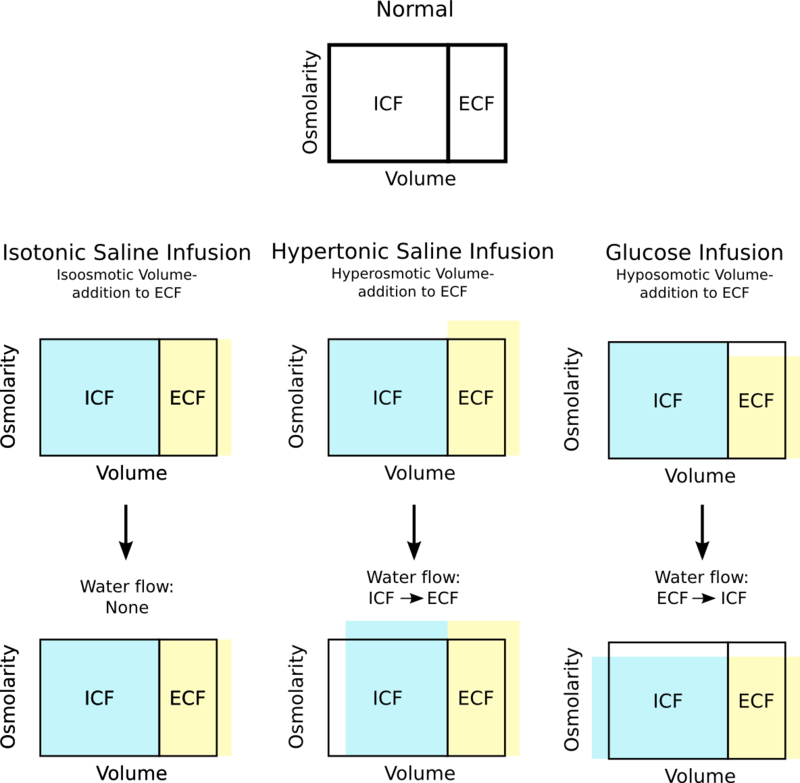 Consequently, there is no movement of fluid between the ECF and the ICF, simply resulting in an isolated increase in ECF volume. This occurs frequently during over-hydration of hospitalized patients. Infusion of saline solution with a greater osmolarity than the ECF will increase in the ECF osmolarity. Consequently, there is movement of water from the ICF into the ECF, thus helping dilute the ECF. Although this movement helps compensate somewhat for the increased ECF osmolarity, it cannot do so completely, and the result is a net increase in ECF osmolarity and volume. When glucose solution is infused into a patient, the glucose is rapidly absorbed by cells, leaving simply water which dilutes the ECF and thus reduces ECF osmolarity. Consequently, there is movement of water from the ECF into the ICF, helping concentrate the ECF. Although this movement helps compensate somewhat for the decreased ECF osmolarity, it cannot do so completely, and the result is a net decrease in ECF osmolarity and a net increase in ECF volume. Graphs similar to the above demonstrating body fluid shifts in response to differing scenarios of body fluid expansion. Once again, movement of fluid between the ECF and ICF is triggered by changes in the ECF Osmolarity. As seen for the case of isotonic saline infusion, no change in ECF occurs and thus now fluid moves between the two compartments.